Mistic Electronic Cigarettes are now available at every Walmart! 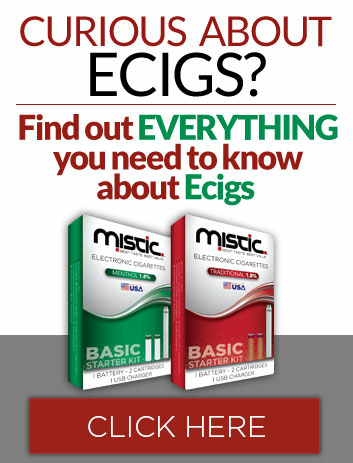 Mistic E Cigs are now in all of the Walmart electronic cigarettes aisles in the United States, with prices starting at under $6.00. Ever wonder: “are there any e cig stores near me?” It is easy to find a Walmart or other retail store near you using our store locator. When you find the closest Walmart, just head to one of the checkout lines that carries tobacco products and ask the associate to help you find and purchase the Mistic products you want. You can find refill cartridges with 1.8%, and 2.4% nicotine by volume in traditional and menthol flavors as well as fruit flavors. If you prefer to buy in bulk, Walmart stores also carry 10-packs of refill cartridges in 1.8% and 2.4% nicotine in traditional and menthol flavors. Also now at Walmart are our HAUS personal vaporizers. Like e cigs, personal vaporizers, like our mods and vape pens, produce a satisfying vapor. But they also give you more vaping control with premium performance like longer battery life. That coupled with HAUS’s many great flavored e juice options, you will be able to take your vaping to the next level. Online promotional pricing and special sales of Mistic Electronic Cigarettes and HAUS PVs are only available at the Mistic online vape store and do not apply to pricing at our retail partners’ locations. WARNING: MISTIC Electronic Cigarettes are intended for use by smokers of legal smoking age in their area, and not by children, women who are pregnant or breast feeding, or persons with or at risk of heart disease, high blood pressure, diabetes, or taking medicine for depression or asthma. If you smoke tobacco products you are encouraged to stop. Identification of all persons under 26 will be required before purchase. MISTIC products are not a smoking cessation product and have not been tested as such. This product and the statements made within have not been evaluated by the US Food and Drug Administration or any other international health or regulatory authority, unless otherwise noted in MISTIC’s materials. These statements and MISTIC product are not intended to diagnose, treat, cure, or prevent any condition, disorder, disease or physical or mental conditions and should not be used as a substitute for your own physician’s advice. MISTIC products contain nicotine, a chemical known to the State of California to cause birth defects or other reproductive harm. Nicotine is addictive and habit forming, and is very toxic by inhalation, in contact with the skin, or if swallowed; danger of serious damages of health by prolonged exposure if swallowed, irritating to the eyes and skin; may cause sensitization by skin contact; may cause harm to the unborn child; vapors may cause drowsiness or dizziness; very toxic; very toxic to aquatic organisms, may cause long-term adverse effect in the aquatic environment. Ingestion of the non-vaporized concentrated ingredients in the cartridges can be poisonous. After contact with skin, wash immediately with plenty of water and seek medical advice; in case of accident or if you feel unwell, seek medical advice (show product label when possible). This material and its container must be disposed of in a safe way; use appropriate containment to avoid environmental contamination.